This week’s Chit Chat Across the Pond was so much fun. 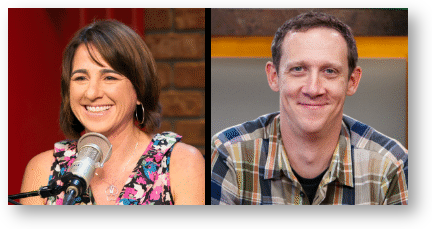 I was joined by Megan Morrone and Jason Howell, who co-host Tech News Today on the TWiT network together. Megan also co-hosts iOS Today while Jason co-hosts All About Android. For an entire month, Megan and Jason swapped phones. They’re here to tell us what they liked, what they didn’t like and answer tough questions like, “Did your children mock you?” I know I say this a lot, but this truly was one of the most enjoyable episodes of Chit Chat Across the Pond. They’re both so entertaining and delightful and we even had some great technical conversations too. You can find Megan at meganmorrone.com/… and @meganmorrone and Jason can be found at @jasonhowell. Hi Allison! Just a quick comment to let you know that you can, in fact, search your purchased apps on the iOS app store. On the iPhone, go to the list of purchased apps and then pull down on the list. That will reveal a search bar right above the topmost app, and that’ll allow you to search only your purchased apps. On the iPad, there’s a *Search Purchased Apps* search bar near the upper-left-hand corner of the Purchased tab of the App Store app. That’s great Greg. I tried it and sure enough there’s a search bar for Purchased Apps that I never knew about on the iPhone. Thank you! Cool, Greg! The place I really need it is on the Mac. Got a tip for that? Hmmm. Seems like it should be easy for Apple to put that in the Mac App Store, but I sure can’t find a way to search purchased apps there. That’s disappointing. If I ever find out how to do this, I’ll let you know.